Bob and Holly Fergason from Alameda, Ca. It doesn't get much better than this! 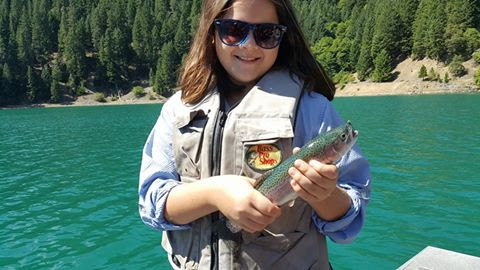 The McCloud Reservoir Summer Trout bite continues to be excellent. 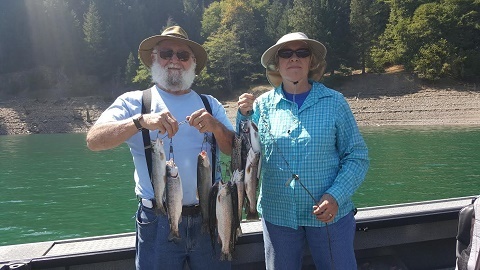 All summer, no matter the temperature, McCloud Reservoir has consistently made trout fishing easy. 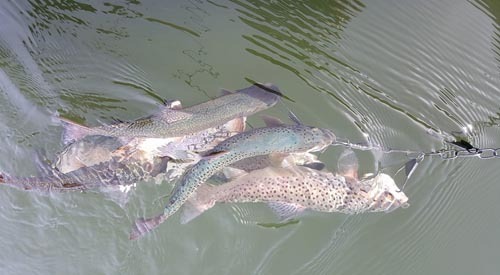 Brook, Brown, and Rainbow trout have been on the bite down to 40 feet. The Rainbows are biting on top, down to 25 feet. Brooks and Browns have been in the 20 to 40 foot range. Trolling Sep's dodgers with white or orange grubs dipped in Pro-Cure Shrimp/Krill oil at 1mph has been producing best at first light. When the sun begins to hit the water a whole threaded nightcrawler soaked in Pro Cure bloody tuna anise, out produces the grub. Broken back rapalas, and k-7 kwikfish in the early morning on the downrigger at 25 feet to 35 feet have been awesome for the Brookies and Browns, the Sep's Dodger methods described above also have been working well for the Brookies and Browns when the sun hits the water. There has been consistent May fly hatches through the day, and opportunities for dry fly action are plentiful. Stealthy is the key approach on that method. Leach and Wooly Bugger patterns, on intermediate to fast sink lines, can be casted or trolled and have been working best in the early morning. 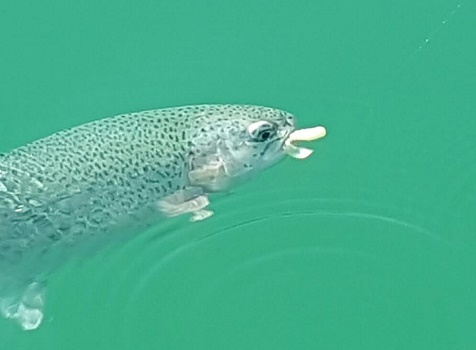 The fishing will continue like this until the weather changes to fall and winter.